Authors Heather Hiestand and Eilis Flynn at Third Place Books and their book, “Wear Black.” There’s more to this story! Last night I attended the Third Place Books author event in Lake City Way for Heather Redmond’s A Tale of Two Murders. There’s two things to everything to be said about it! 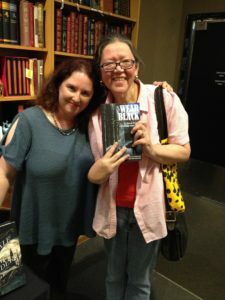 First, I’m affiliated with Heather two ways — as co-author (on Wear Black, which we’re holding here) and as editor for her independently published works. Second, Heather writes with at least two pseudonyms — Heather Hiestand (the name on what she’s written with me) and Heather Redmond — the name she’s using for her successfully launched Charles Dickens murder mysteries. Third, yes, although I edit as Elizabeth M.S. Flynn, my pen name is Eilis Flynn. I’m sure you’ve found some of those books. I hope you’ve found them enjoyable. I’ve just reissued the book of my heart, Festival of Stars, a multicultural romance based on a beloved Japanese folk tale. Fourth, (although you’ve figured this out) I’m both an editor and a published author. So I have a pretty good idea what authors go through and bring all of that experience to bear on any project I edit. So that’s four twos. Is that too much? I Edit. I Write. I Talk About Ghosts. There Will Be Dragons — In Everett!